London; a city full of secrets. If any city has a magical underbelly, it’s London. The city looks magical as it is – two thousand years of history held together with nothing more than hope and duct tape. Neil Gaiman did a very good job of showing a version of this in Neverwhere. Parts of the Harry Potter books are set in London, and Doctor Who has turned practically every noteworthy building and statue into something sinister. I even gave it a bit of a go in my own novel, The Atomic Blood-stained Bus (available at all online ebook retailers, just saying). However, I had yet to embark on this series, despite a number of people saying that it seemed like my sort of thing. One even said it read a lot like my book, which took on a weirder note when the final chapter of this has a moment that almost completely mirrors the opening chapter of my own. Weird. 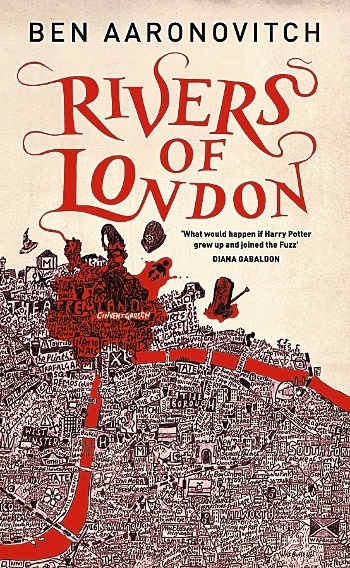 In Rivers of London, we meet DC Peter Grant, two years out of Hendon and finding himself now standing guard at a spot near where a man has had his head taken off by an unnamed assailant. So far, so crime novel, but then he takes a statement from one Nicholas Wallpenny who turns out to be a ghost. He tells his colleage Lesley May about it and while she’s a little skeptical, she merely uses it to tell him that this is why he will never be considered a proper copper, and will undoubtedly be shifted off to work in an office for the rest of his career. While hunting down the ghost again later for a second interview, Grant meets DCI Thomas Nightingale and before you can say expecto patronum, he is pulled into a branch of the Met that deals with ghosts, vampires, trolls, river gods and wizards, his own training to become a fully-fledged wizard immediately underway. When the prime suspect from the first case reappears with his face falling off, Grant realises that this is not your average case, and soon he must learn how to get a better hold on his magic if he’s to catch the perpetrator, who seems more than capable of changing his face at will, and seems to enjoy causing mayhem around the city. As more bodies fall, Grant also finds that he’s having to broker peace between Mother and Father Thames, who are fighting again about which parts of the river they own. London crime just became a lot more confusing. It’s a funny, smart, quick-witted novel, for sure. The rules of magic are rather scientific and interesting, taking up to ten years to become skilled enough to use it well and with ease. The beauty of it is that magic isn’t a complete secret. The public seem unaware of it by and large, but the police know it happens, so know when to call Nightingale in when the crime strays into the supernatural. It doesn’t mean they like the idea though, and most of them are downright hostile to the idea of magic, dreading the m-word turning up in their official reports. Grant’s friend Lesley seems more open to the idea, and after a few Potter-based jibes, seems to go with the flow and understands that spells are being cast and ghosts are being hunted. Despite being clever and interesting, it lacks something, but I simply cannot put my finger on what it was. The plot veers a little too wildly at times, with non-sequitur scenes thrown in that seem to have no build-up and aren’t mentioned again, such as the killing of two vampires. The title comes from the battle between the two Thames gods, Mama Thames who controls everything downriver and the Old Man of the Thames who controls upriver, the divide occurring at Teddington Lock, and while some of the minor characters come in from this network, none of the business with these factions ever seems too pressing. Aaronovitch is perhaps trying to tell two stories at once that brush against each other but never fully connect. The characters are great, mind. Peter Grant is a strong addition to the pantheon of fictional crimestoppers, a mixed race daydreamer with a vaguely scientific background and a strong role model in his mother, compared to his father who is a drug-addled jazz musician. While we hear a lot about them, we don’t see much, although from what I gather, that comes in the sequel. Nightingale is sufficiently mysterious, and there are many questions about his housekeeper Molly that I don’t think I want answered, simply because I’m scared. The non-river plot is perhaps stronger, and invokes one of the most terrifying things in our culture that people seem to forget is as horrific as it is – you’ll know it when you come to it. If you love London, crime, magic or surprises, then give this book a go, because I definitely think that, despite something in my head not adding up, it’s a series worth spending time with.